InterCoastal Net Designs has partnered with Acme House Co to fully redesign their website and to enact a major new feature– a brand new booking integration engine. Set against the San Jacinto Mountains, this resort town fully immerses travelers with the luxury and modernism that surrounds Palm Springs. 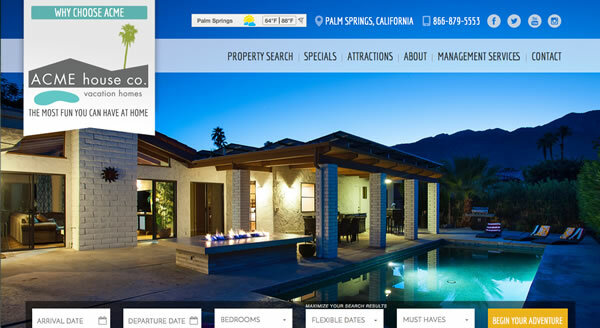 An array of vacation homes of all sizes, Acme House Co – Palm Springs Vacations. entertains a variety of styles for every occasion. With mega concert events yearly as well as some of the best art and architecture socials, Palm Springs remains a huge draw for vacationers. After several months of collaboration with ACME house co. and ICND’s design team, this complete overhaul was successfully launched. In addition, ICND took this opportunity to feature their new booking integration software. These features include, a modern, mobile friendly design, a stronger focus on lead conversions, advanced tracking and reporting as well as a completely enhanced search interface. This will help users adjust search parameters without the constant refresh flickers. Vacation rental managers and owners are sure to take notice of many of these enhanced features. The entire vacation rental industry is in good hands moving forward.